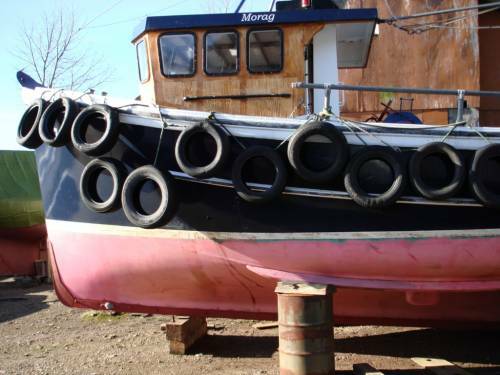 This is usually the most comprehensive type of marine survey and is to be most strongly advised when a client is purchasing a second hand or used craft. It takes place when a prospective owner asks an independent Marine Surveyor to inspect the craft and its machinery, rig, service systems and equipment. This establishes whether the vessel is fit for its designed purpose, identify as far as is practical any faults, and whether these are major, minor or merely cosmetic. A pre-purchase survey starts with a full out of water inspection of the hull including a wetness measurement of the shell if appropriate, as well as structural integrity and water tightness. Note that surveys can be conducted in the water although the shell, keel, rudder, stern gear, and underwater fittings below the waterline will not be inspected. This type of survey checks the condition and effectiveness of the cathodic protection, a detailed examination of the machinery (non-invasive), propulsion, fuel, electrical, gas, sewage, water and other 'domestic' or service systems. A sea trial should be conducted, where practical. The nautical items, cosmetic appearance and an assessment of the overall level of maintenance, general condition, structural and mechanical seaworthiness of the craft will be established. A pre-purchase survey should be carried out first with the craft out of the water then afloat, although this may incur extra charges. This type of survey is intended to establish the damage (defined as the loss of value or usefulness) as a result of an incident such as grounding, collision or storm damage. These surveys are usually instructed by an insurance company to assess the extent of any damage resulting from an alleged casualty, in order that they can establish liability under the marine insurance policy. Views on any recommended repairs, an estimate of the cost of such repairs, and the probable cause and consequent damage are usually required. This type of survey may be included in the pre-purchase survey if the client specifies it, at little additional cost. In addition to establishing whether the vessel is fit for its designed purpose and any defects it may have to be conducted in order to determine or justify the fair market value of the craft, and is normally needed for insurance, mortgage or other financing, probate, donations and/or legal cases. It should be borne in mind that, in the latter case, the surveyor may also have to justify his assessment of value before the Courts and should be able to confirm his assessment from published or other publicly available data for similar types of craft. It should also be clearly stated in the surveyor's report that this type of survey does NOT constitute a pre-purchase survey and it should not be offered or regarded as such. This survey is conducted so that a prospective underwriter can determine whether or not a vessel is an acceptable risk under marine insurance policy clauses. This survey should include an out of water inspection and covers structural integrity of the vessel for it’s intended or declared use. Most insurance companies will require such surveys on older vessels, valid for a specified period, and an appraisal of fair market value. It should be noted that a comprehensive pre-purchase survey will establish most of these requirements.